My website features the best Brantford real estate search for homes, condos, land and foreclosure properties available. It is the only site you will ever need! It is easy-to-use and updated by the official MLS database every 15 minutes. You can save searches and get daily email alerts of new listings, price changes and market reports. My Interactive Map Search allows you to view properties on a map or refine your search by drawing the boundaries around the area you desire. Burford, Ontario is a small community located approximately 22.5 kilometers South West of Brantford. Burford is a quieter Town to live in with privately owned restaurants, a farmer’s market, coffee shops and is surrounded by farmland. The Burford Real Estate Market has consistently been strong and the area is attractive to Buyers and Sellers that enjoy knowing their neighbours. With properties ranging from smaller entry-level housing to sprawling estate residences, there is something for everyone. 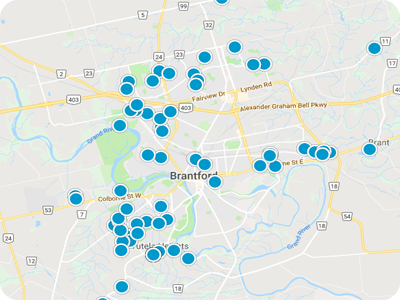 Our site Property For Sale in Brantford, provides real-time MLS Listings that are updated multiple times per day to ensure our clients are the first to know about any active listings in the Burford area. Burford shares its’ school district with Brant Haldimand Norfolk Catholic District School Board.